The world needs to adapt to climate change. Regardless of the level of effort to reduce greenhouse gas emissions, some adaptation will be necessary. The adaptation challenge is thought to be greatest in the developing world, especially “least developed countries”, which are in the unfair position of being the least prepared to respond to a problem they did not create. In response, developed countries and international institutions like the World Bank are increasingly directing aid towards climate change adaptation. Under the UN Framework Convention on Climate Change, the developed world has agreed to mobilize $100 billion per year by the year 2020 to help the developing world respond to climate change. How will this work on the ground? How will adaptation decisions be made, given that the future is uncertain and countries are relying on the highly imperfect international development apparatus for resources and expertise? There is a lot of terrific theoretical work on the “coulds” and “shoulds” of adaptation, but less forensic analysis of how it happens on the ground. A new paper by Sophie Webber and I in Sustainability Science attempts to fill that gap, using a case study of preparing for sea level rise in Kiribati. As home to the World Bank’s first climate change adaptation project, Kiribati is an ideal place to learn about the challenges of adaptation on the ground (close to the ocean as that ground may be!). 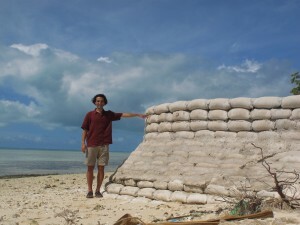 Visitors to Tarawa can see the office of the Kiribati Adaptation Project, public notices and signs, new seawalls, equipment for the mid-lagoon dredging project, mangrove saplings planted alongside several causeways, new water tanks in certain villages, and construction of new water pipes for the reticulation system. Like all first steps, these initial actions towards adapting to an uncertain future are cautious, unsure and sometimes backwards. This entry was posted in Features, Policy, Solutions by Simon Donner. Bookmark the permalink. If in fact climate change is to “hit the poor the hardest”, then that statement likely applies not just between countries but within them. Adaptive capacity certainly varies within a country, even within individual cities or neighbourhoods. Just think of how is threatened by a heat wave or a cold snap – the sick, the elderly, the homeless, the poor. Your scenarios are rather extreme, but one could certainly imagine a drier southwest having a disproportionate impact on the poor in California. I wonder about the belief that climate change will hit the poor the hardest. Consider California. What happens if the US SouthWest turns into something resembling the Sahara? Or what happens if a flood greater than what paleo studies show is possible under the relatively stable conditions of the last 1,0000 years submerges a sizable portion of the built environment in the state? They had one in 1860 that flooded about 1/3 of California and bankrupted the state. A study of the impact of a far less severe event called ARKstorm ranked the damage as similar to the biggest expected earthquake. “California’s Other Big One”. “The West Without Water” by Ingram and Malamud-Roam is an interesting read. It seems to me that the wealthy First World has the most to lose, especially if tension between losers and winners leads to nuclear war.